Design and implement a remediation program to remove a highly concentrated contaminant mass in soil that served as an ongoing source to an extensive groundwater plume. 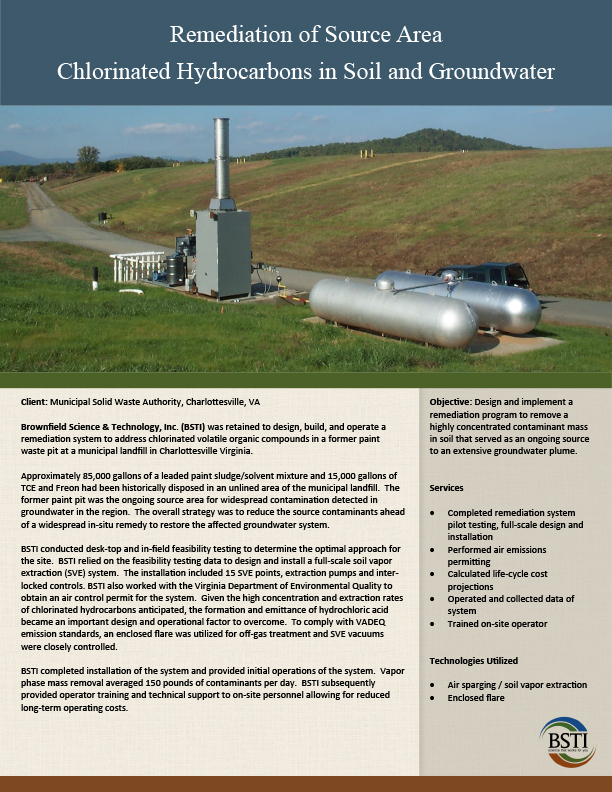 Brownfield Science & Technology, Inc. (BSTI) was retained to design, build, and operate a remediation system to address chlorinated volatile organic compounds in a former paint waste pit at a municipal landfill in Charlottesville Virginia. Approximately 85,000 gallons of a leaded paint sludge/solvent mixture and 15,000 gallons of TCE and Freon had been historically disposed in an unlined area of the municipal landfill. The former paint pit was the ongoing source area for widespread contamination detected in groundwater in the region. The overall strategy was to reduce the source contaminants ahead of a widespread in-situ remedy to restore the affected groundwater system. BSTI conducted desk-top and in-field feasibility testing to determine the optimal approach for the site. BSTI relied on the feasibility testing data to design and install a full-scale soil vapor extraction (SVE) system. The installation included 15 SVE points, extraction pumps and inter-locked controls. BSTI also worked with the Virginia Department of Environmental Quality to obtain an air control permit for the system. Given the high concentration and extraction rates of chlorinated hydrocarbons anticipated, the formation and emittance of hydrochloric acid became an important design and operational factor to overcome. To comply with VADEQ emission standards, an enclosed flare was utilized for off-gas treatment and SVE vacuums were closely controlled. BSTI completed installation of the system and provided initial operations of the system. Vapor phase mass removal averaged 150 pounds of contaminants per day. BSTI subsequently provided operator training and technical support to on-site personnel allowing for reduced long-term operating costs.